For the last several years, two red-tailed hawks, one male and one female, have made a nest on the west side of the STEPS building at Lehigh. Each spring, the Lehigh community has enjoyed watching these “Mountain Hawks” nest, hatch eyas and grow into a family via live stream. 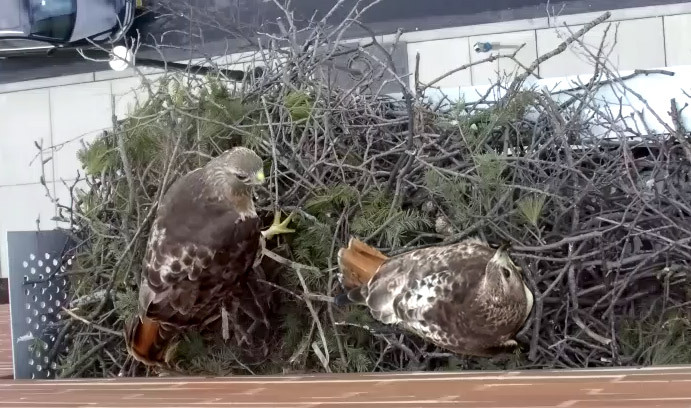 Fascinated by the bird’s activity, George Yasko, Lehigh’s field projects laboratory manager, had the idea to install a webcam to share a live feed of the hawks’ nest with the Lehigh community. His idea became a reality in Fall of 2015 when a high-end web camera was installed with the help of the Office of Sustainability, Library & Technology Services and Facilities Services. In 2016, students, faculty, staff, alumni and local friends helped name our hawks after a social media contest. The Lehigh community voted via Facebook and Twitter and named our feathered friends "Engi" (pictured here on the left) and "Neer” (pictured on the right)! Lehigh invites community members to view live stream of hawks’ nest and name its feathered occupants.